US President George Bush has begun a two-day visit to the UK as part of his final European tour before he leaves office in January. 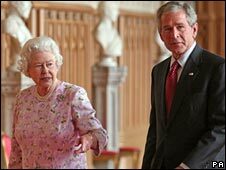 Mr Bush met the Queen at Windsor Castle before he and his wife, Laura, dined with Prime Minister Gordon Brown and his wife, Sarah, at Downing Street. 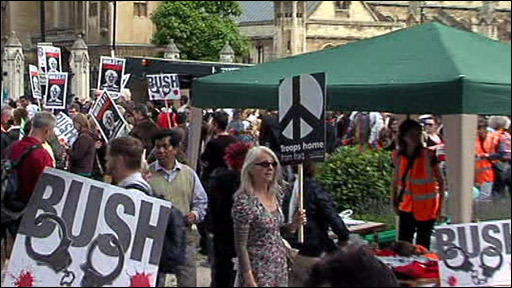 His visit was met by hundreds of anti-war protesters in central London. When the two leaders meet formally on Monday they are expected to focus on the Middle East, fuel and food prices. handshakes and back-slaps before going inside. BBC world affairs correspondent Mike Wooldridge said the dinner - which was also attended by about 20 guests including three leading British historians - was more social than political. He said it was "designed to set the mood for a visit that both countries would clearly want to be about more than Mr Bush taking leave of Britain as he heads towards the end of his presidency". The global economy, and the battering it was taking from the fuel and food price crisis and the credit crunch, was at the top of the agenda for Gordon Brown during the visit, said our correspondent. He said: "He wants President Bush's commitment to secure the elusive deal on global trade reform that could ease some of the economic problems." Monday's talks are also likely to cover Iran and its nuclear ambitions. Earlier, Mr Bush told Sky News he was sorry "innocent civilians" had died in Iraq, but he was still certain the invasion was the right thing to do. He also downplayed suggestions of disagreement between Britain and the US on Iraq. "I have absolutely no problem how Gordon Brown is managing the Iraqi effort," he said. During his visit Mr Bush is also to meet former prime minister Tony Blair in his capacity as Middle East envoy. Shortly before the US president met Mr Brown, hundreds of demonstrators gathered in Parliament Square to shout: "George Bush - terrorist". The protest rally was organised by the Stop War Coalition, CND and the British Muslim Initiative. The demonstrators had planned to march to Downing Street, but police closed down Whitehall and used heavy reinforcements to ensure the metal barrier they erected was not breached. Police said at least 10 officers received minor injuries, and 25 people were arrested. Andrew Burgin, a spokesman for the coalition, which earlier staged a small demonstration outside Windsor Castle, said: "We think Bush is a war criminal. Both Blair and Bush are responsible by duplicity and lying for an illegal invasion of Iraq." Mr Bush's 45-minute tea meeting with the Queen was billed by Buckingham Palace as a "private and informal" visit between "old friends". I do not think Bush's visit is worthwhile. I am proud to be an American, but I am ashamed of Bush. He hasn't done any good for anybody. They were joined by the Duke of Edinburgh, American ambassador Robert Tuttle and his wife, Maria. Their traditional tea of cakes and finger sandwiches was followed by a brief photocall in St George's Hall in Windsor Castle. The president's short UK visit, which comes at the end of a six-day European tour, involves a large security operation, involving 1,200 Metropolitan Police officers each day. Mr Bush also travels with his own extensive protection team, including the presidential motorcade. Large swathes of central London are expected to be closed at varying times to accommodate the visit, and police say they were prepared for the planned protest on Sunday.